When furniture is picked up by a carrier, we do not consider or contend that we don't have any further responsibility. If you have a problem with a carrier, we will solve it. If the furniture is damaged or lost, we will repair or replace it. You will not have to file a claim or haggle with a bureaucracy. 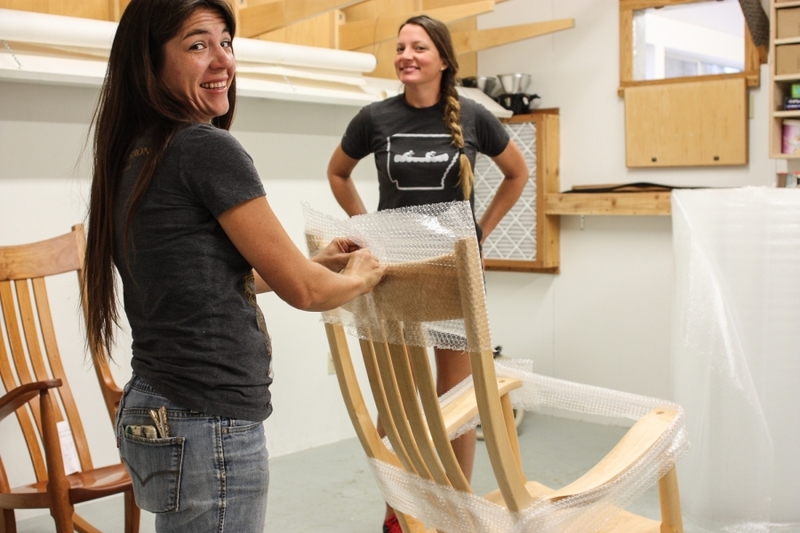 Crated: We crate rocking chairs, 1-4 dining chairs or barstools, and smaller items in our shop. We use multiple layers of reinforced cardboard. Your furniture will be delivered to the door, but not unpacked by the driver. Blanket-wrapped: Larger shipments are wrapped in blankets in our shop and in our presence. Your furniture will be set where you specify and all debris removed. Picked up at the shop: You may come for your furniture. For pickup here, deduct 5% from the prices on this website. With your invoice or upon request, we will send a shipping information sheet with details. Additional shipping charges apply. We will give you a firm price for delivery and a description of the method. We will give you a firm price (in US dollars) for the furniture, delivery, customs brokerage fees, and any taxes due. We will invoice and collect these amounts. The furniture will be delivered to your address with no further amounts due. Your credit card company can make the currency exchange. We will give you a firm price (in US dollars) for delivery to your address or, for less cost and at your option, for pickup at the nearest international airport terminal. Any duties or taxes will be collected from you at final delivery. We will provide contact information for a person or an office that can provide those amounts for you before you approve the sale.